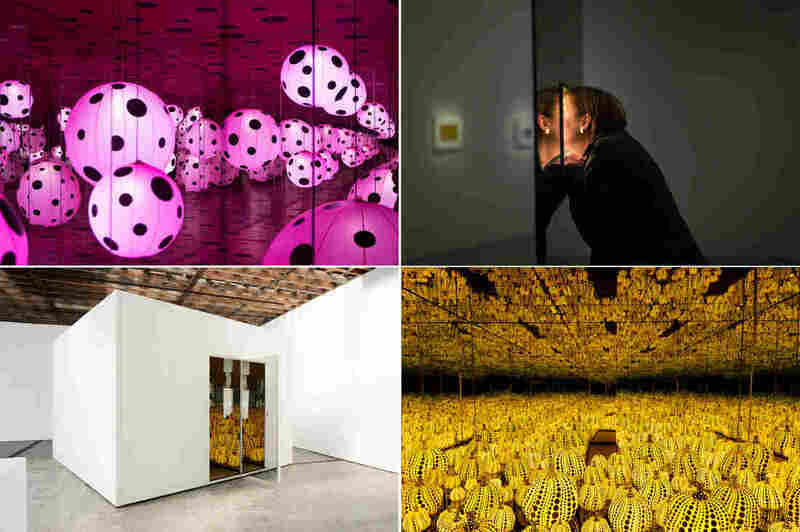 'Priestess Of Polka Dots' Yayoi Kusama Gives Gallerygoers A Taste Of Infinity The Japanese artist is known for her "infinity rooms," which have mirrored walls that make the space feel endless. Six of those rooms are now on display at the Hirshhorn Museum in Washington, D.C.
Yayoi Kusama with recent works in Tokyo in 2016. In 1968, Kusama wrote, "Our Earth is only one polka dot among a million stars in the cosmos. Polka dots are a way to infinity." At first, walking into one of Kusama's infinity rooms can be disorienting. One room, The Souls of Millions of Light Years Away, is pitch black except for a spray of flickering red, green, yellow and blue lights — like little jewels suspended in mid-air. They seem to go on forever; you're not sure what you can touch and what's out of reach. The Souls of Millions of Light Years Away by Yayoi Kusama, 2013. Hirshhorn Director Melissa Chiu says the room makes "you feel as if you're a speck in amongst something greater." That idea — that we're all just specks in the universe — has captivated Kusama for decades. In 1968, she wrote, "Our Earth is only one polka dot among a million stars in the cosmos." And with her infinity rooms, you almost lose any sense of space. "She shocked the living daylights out of people," says Richard Castellane, Kusama's art dealer in New York in the 1960s. He remembers one infinity room that was full of phalluses and another that had masses of blinking colored lights and a Beatles soundtrack. "The machine would be setting off these lights in almost like a machine-gun rhythm," Castellane says. "And what occurred, of course, was the lights would bounce from mirror to mirror to mirror to mirror, and you couldn't focus on anything. You had no sense of space because space was infinite." Kusama's work astonished her 1960s audience. "They were just mesmerized and rather overwhelmed," Castellane says. "It was something very new." Castellane describes Kusama's mind as "brilliant" and "inventive" — but it also terrified her. She grew up in a mountain city in central Japan during World War II. In her autobiography, Infinity Net, she writes that she suffered from hallucinations — violets in a field suddenly had human-like faces and voices. She would draw the visions in sketchbooks that she carried with her everywhere. "Recording them helped ease the shock and fear of the episodes," she writes. But Kusama's mother fiercely objected to her art and took away her supplies. She believed art wasn't respectable work — especially not for a woman. 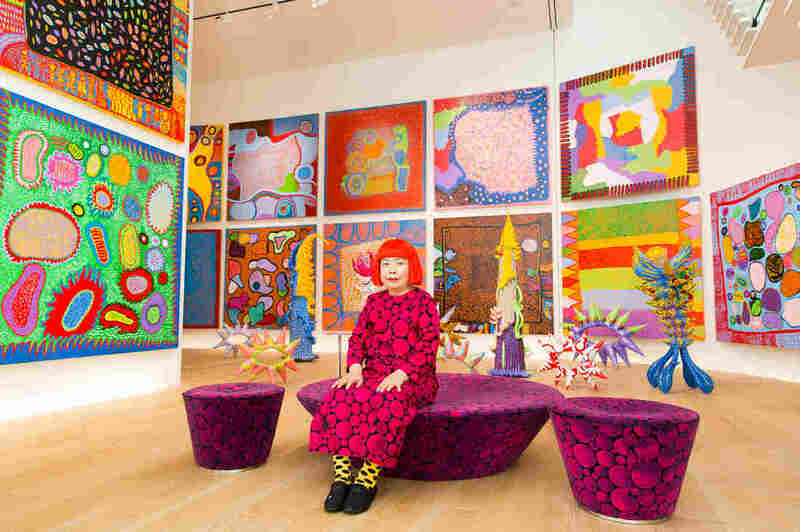 In 1958, when she was almost 30, Kusama did what a lot of creative people were doing: She moved to New York, where she thrived in the downtown art scene. Kusama was in shows throughout the U.S. and Europe; she designed polka dotted dresses that were sold at Bloomingdale's; and she organized anti-Vietnam War "happenings" where she would sometimes paint polka dots on naked bodies. People started calling her the "Priestess of Polka Dots." Richard Castellane says Kusama was fearless. "She was very gutsy. I never sensed any self-doubt. And also, she really felt that what she was doing was important." But gaining respect as an artist wasn't easy. Hirshhorn Curator Mika Yoshitake says, "It was tough to get the attention in a very male-dominated art world at the time. She also was exoticised — and she didn't hide it, either. She was wearing kimonos and presented this kind of exotic, oriental figure." Yayoi Kusama in her Phalli's Field infinity room in 1965. Art dealer Richard Castellane says Kusama "shocked the living daylights out of people" with her art. 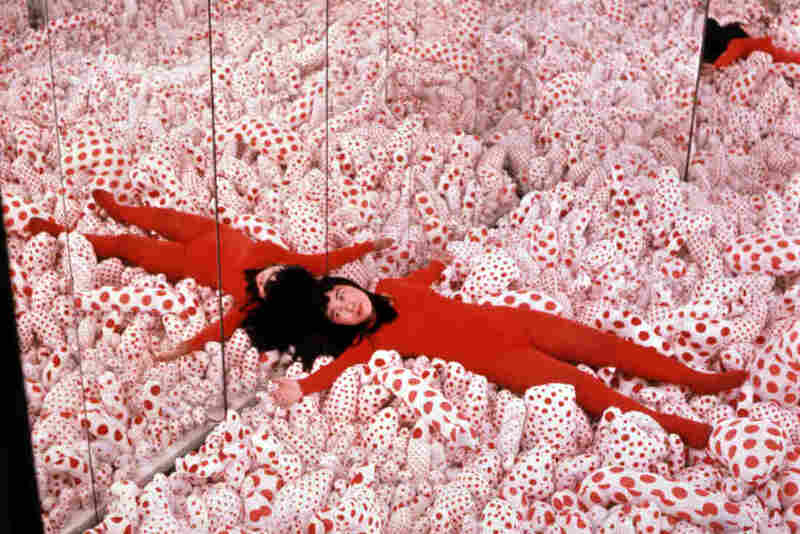 Despite her successes, Kusama was barely making ends meet, and she continued to hallucinate and have panic attacks. In the early 1970s, she moved back to Japan and committed herself to a psychiatric institution where she has lived, by choice, for more than 40 years. Kusama couldn't travel to Washington for the opening of her show at the Hirshhorn, but her creative life continues. She's written poems and novels, and she paints in her studio every day. She's made new infinity rooms, which are on display in the new show — one filled with huge, neon pink balloons; another with bright yellow pumpkins. Both are decorated with her signature polka dots. In a video interview with Hirshhorn curators, Kusama talks about her need to explore and create other worlds. "Far beyond the reaches of the universe," she says, "infinity is trying to communicate with us." Editor Rose Friedman, digital producer Nicole Cohen and photo editor Claire Harbage contributed to this report. Aftermath of Obliteration of Eternity by Yayoi Kusama, 2009.